Some of our Healthcare Pre-Apprenticeship Training students listen to a guest speaker. Instructor Kristie Kleha is in back, left. Join us in offering a warm welcome to our very first cohort of students in our Healthcare Pre-Apprenticeship Training Pilot Program! The Program offers the necessary foundation for Fairfax County residents to pursue better-paying jobs in the healthcare fields where there is a great need for skilled workers. 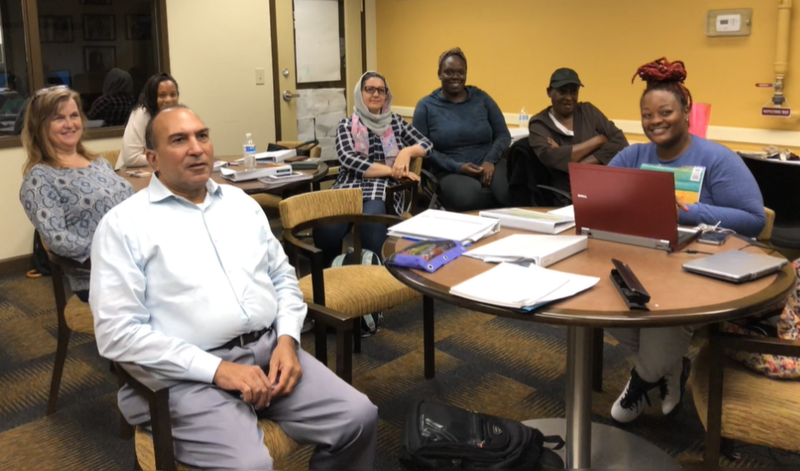 It is a pilot program formed in partnership between Britepaths/Financial Empowerment Center at South County (FECSoCo) and Fairfax County’s Department of Housing and Community Development, and is funded through the Fairfax County Community Funding Pool. Initial client recruitment is focused on Department of Housing clients in the South County area. The first cohort began their 12-week session on September 10. The nine students attend classes Monday through Friday. Britepaths’ Adult Basic Education Instructor Kristie Kleha provides their primary instruction, incorporating job readiness skills with the enrichment of math, reading and writing that are contextualized for healthcare. We would like to thank Fairfax County, the Department of Housing, Computer C.O.R.E., Northern Virginia Community College, and all the community partners, guest speakers and volunteers who are supporting the launch of this pilot. We are also reminded of our dear friend and long-time volunteer Diane Jenkins, who helped inspire and inform our initial proposal for this program. Diane was a retired Department of Housing Specialist who worked throughout her career to help her clients improve their lives. She passed away in July 2018, and it is heartening that her memory will live on through the success of students in this Program. Read More about Diane.